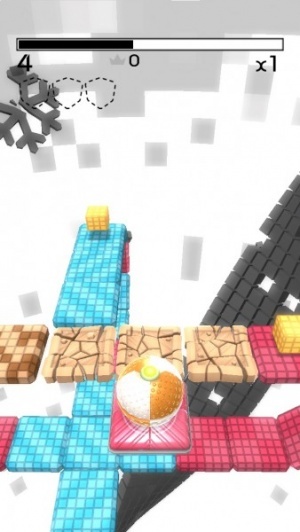 Roll a ball from platform to platform in Unpixelate, a challenging but cumbersomely designed puzzler. It’s not a great sign when a tutorial baffles you sufficiently that you end up googling for a solution to a simple control issue. Unpixelate doesn’t have the most promising of starts, but it does work out ok in the end. If you’re patient. 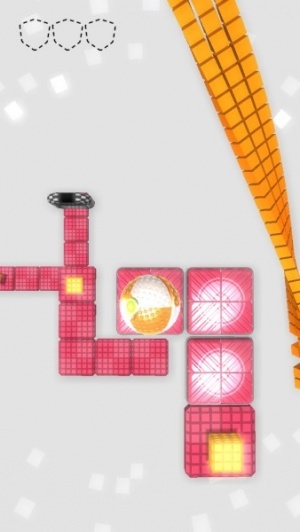 Each level of this puzzle game involves manipulating a ball around a circuit and collecting items before heading to the exit. It’s a simple premise but it’s heavily clouded by awkward controls. You tap around to move, with the ball not going anywhere unless you tap, but the cumbersome part is jumping and moving the camera. A tutorial level suggests that jumping requires a swipe, but it actually requires a double-tap on an adjoining platform. That double-tap is also quite easy to activate when doing mostly anything else, meaning things can go disastrously wrong pretty easily. Camera issues tie into this as well, as when using two fingers to move around sometimes you’ll find yourself inadvertently double-tapping and, oh look, you’re back to the start of the level! Many levels rely on you looking around to scope out when to fall down or where to go next, and pinching and dragging just isn’t as convenient as it needs to be. Throw in the fact that early stages aren’t particularly interesting and no one could blame you for giving up prematurely on Unpixelate. Once you get further in the levels are more challenging, with things like teleporters and special blocks and buttons providing some variety. You also come to accept the limitations of the control system, although it’ll still catch you out from time to time.